Thousands and thousands of educators around the world use Facebook to connect with others around the world. Some have two Facebook accounts – one for personal use and one for professional. Some can balance the two in one account. Until my Facebook mentor, James Taylor (as I like to call him!) explained it to me in detail – the advantages and disadvantages of it, the uses and so on. What did I find great about it in the end? First of all, if it works for you (like it eventually did for me), it can be a super tool for professional development. It allows you to connect with educators all around the world – you can read their profiles, see who they are connected to and adjust your saftey settings, if you do not want just anyone friend you/ You can approve all the people though. What I really like about Facebook is that it is very visual. You can see photos right away, add links and anything you like. It is very colourful and pleasant to read, most of the times. There is no word or character limit (the character limit on Twitter can be a bit of an issue) – however, I find you can write as much as you like, but again, being laconic (as much as possible) can be an asset. I absolutely love the fact that you can join groups related to topics that interest you. You can hold chats there, post relative links and photos, they can become great communities to share and learn! Another thing I like are pages. I have pages related to my new business, where I can post information, new events and developments and the people who have ‘liked’ my page can always get updates. Similarly, I can get updates on the pages of others I have also ‘liked’. There are surely so many other uses for Facebook for teachers and I am still learning – feel free to link any posts you have written or leave more ideas in the comments below. Note (23.08.2015): As of two weeks ago, I no longer use Facebook – no issue with it, but I realised that with work and studies getting busier and busier, something needed to go. It is up to each educator, to choose which one(s) they will be using and for how long! It is enough even on one social medium, or five minutes on one selectively – we can always learn anywhere! 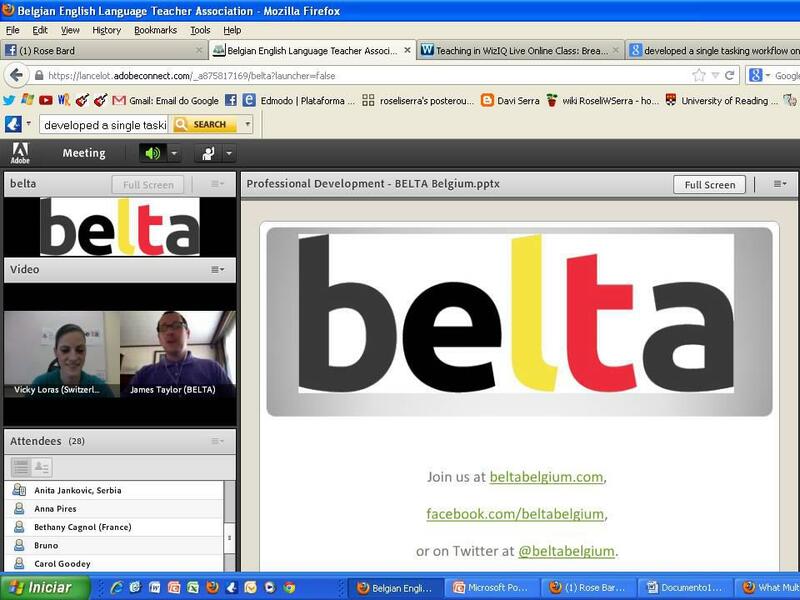 Today was the day of the first webinar for BELTA Belgium, a great new association for English teachers in Belgium and everywhere, in fact! BELTA was founded by James Taylor, Mieke Kenis, Ellen de Preter, Guido van Landeghem and Jurgen Basstanie. You can read more about the foundation of BELTA and also watch the launch event here. I have also created a PDF file with the most useful links. Here is the link with the recording of the webinar, which will also be published on the BELTA blog, Facebook and Twitter. A huge thank you to BELTA and everyone who was there (including my parents! ), in the Adobe Connect room and to my sister, Eugenia, who was there in the same room as I was, cheering us all on (and also helped me find a title to this blog post)!